Walking Tours of Manchester are organised in association with Dr Mike Nevell from the Centre of Applied Archaeology at the University of Salford and are intended to highlight key points around the city associated with Manchester’s transport and telecommunications heritage. These tours are normally organised to coincide with events such as the Manchester Histories Festival and the Greater Manchester Archaeology Festival. We have provided on this webpage a map showing the key locations we visit on the tour (although depending on the duration of the tour, not all sites may be visited) and each of these acts as a link to additional information. The intention is that participants can access this information as they follow the tour or, indeed, can use it for a self-guided walk or read it at their leisure at other times. What follows is a general introduction to the development of Manchester however, you can skip this and go directly to the map if you prefer. Manchester is known as ‘Cottonopolis’, the 19th century textile manufacturing centre of the world, but it has also been described as a ‘citadel to commerce’. By the 16th century it had already established an early pre-eminence as a cloth town which combined manufacture with trade. In the 18th century, when the cotton trade expanded, Manchester was well placed to exploit its potential for wealth creation. A stranger approaching the town in 1783 would have seen one mill, that owned by Richard Arkwright, on Miller Street in Shude Hill. In 1816 they would have seen some 86 steam-powered cotton spinning mills. Little of this first industrial town survives, but the area around Kelvin Street, the modern Northern Quarter, has a variety of domestic, industrial and commercial buildings from this period. The city was the leading centre of cotton spinning during the first half of the 19th century and there are a number of surviving early mills. The Chorlton on Medlock area has an important early grouping including Chorlton New Mill, probably the oldest surviving example of fireproof mill construction in Greater Manchester. However, the development from home-based manufacture to factory production is best illustrated in Ancoats, which was laid out as part of a planned expansion of Manchester. Ancoats was the first industrial suburb based on steam power and contains a notable grouping of mills, whose architecture, design, fireproofing, innovations and improvements in processes span the industrial revolution. At one end are the 18th and early 19th century mills - Murrays, McConnel & Kennedys and Beehive - rare survivals of early mill construction, and at the other end Paragon and Royal Mill, two spinning mills of advanced design driven by electric motors. The transport revolution of the 18th and 19th centuries transformed Manchester into a major transport interchange and helped to boost the growth of the cotton industry. The Bridgewater Canal which terminated in Castlefield pioneered a process which ended in industrial Manchester being the nexus of the transport revolution in the region. In 1830 Manchester achieved another transport first with the arrival of the Liverpool & Manchester Railway line, which terminated at Liverpool Road Station in Castlefield. Within a few years Castlefield was criss-crossed by an array of railway viaducts. The Liverpool Road terminus has the distinction of being the oldest railway station in the world and pioneered separate facilities for different classes of passengers. The station is backed by the impressive 1830 warehouse, which was the first building on the site to be completed. With the exception of a mezzanine floor, inserted in 1831, it is intact and represents the perfect expression of the functional tradition. As cotton grew in importance, and the railway network around the city developed, so Manchester was to gain a pre-eminence in engineering. Large numbers of foundries and engineering firms were created and examples can still be found in surrounding districts such as Gorton, Newton Heath and Openshaw. William Fairbairn, one of the most celebrated Victorian mechanical engineers, established his engineering works in Ancoats and supplied all the iron work in the construction of mills. The number of cotton mills in Manchester reached a peak of 108 in 1853. Thereafter the number began to decline and Manchester was surpassed as a centre of cotton spinning by Bolton in the 1850s and by Oldham in the 1860s. However, this coincided with the rise of the city as the financial centre of the region. The decline of cotton manufacturing, particularly after 1883, and the need to boost trade were some of the reasons used to justify the construction of the Manchester Ship Canal. In the late 19th century new mills were built in the suburbs and the massive Victoria Mill at Miles Platting exemplifies the new construction techniques and improvements of these late mills. The last Manchester cotton mill, built in 1924, was at Miles Platting. Manchester’s dominance as a financial and commercial centre in the second half of the 19th century is reflected in the number of warehouses built within the city centre. As early as 1806 there were 1,182 warehouse units for rent and by 1815 there were 1,819. Consequently, Manchester has been called the ‘warehouse city’. At first these were concentrated around King Street but by 1850 they had spread to Portland Street and by the early 20th century to Whitworth Street. One of the best concentrations is along Charlotte Street demonstrating the ‘flamboyant facades and very plain rears’ and consistent proportions of the ‘palazzo’ warehouse blocks. Other notable triumphs include Richard Cobden’s building in Mossley Street, the first palazzo warehouse, the exuberant Watts warehouse of 1854, and the later packing warehouses, built on an imperial scale and centred around Whitworth Street. Covering a square mile of Manchester, ‘warehouse city’ is arguably the finest expression of a Victorian commercial centre in Britain. 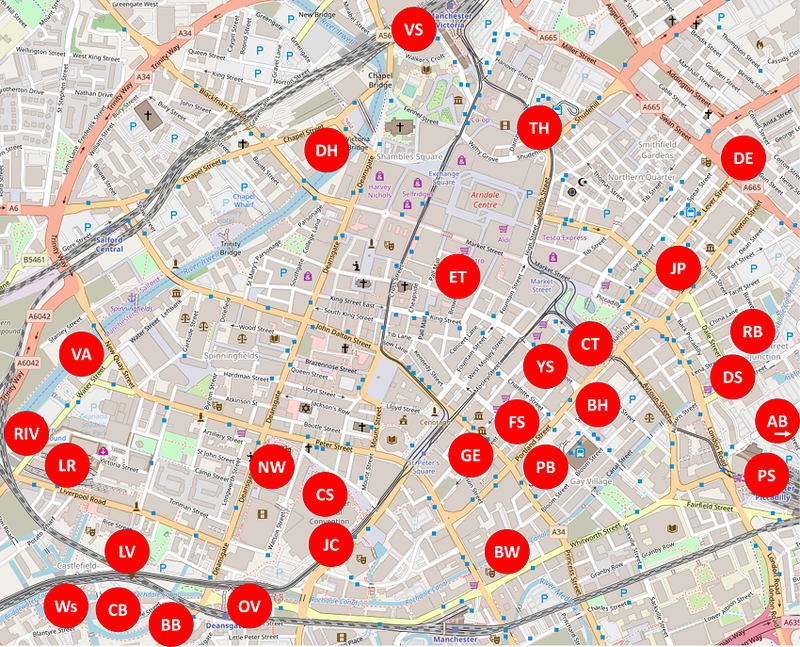 Places of interest relating to Manchester’s transport and telecommunications heritage are indicated on the map below by circles with letters inside them. Clicking one of these circles will produce a pop-up that tells you what that site is and provide a link to further information or the option of returning to the map. Thank you for exploring Manchster’s transport and telecommunications heritage. We are constantly seeking to improve these webpages and therefore very much welcome your feedback, new information to add and suggestions for other places of interest that you feel we should include. Do please get in touch with us.